The words of this Psalm pretty much defines God’s omniscience. We worship a God that is all knowing. These verses say that God’s understanding is limitless, that His knowledge is perfect, and that there isn’t a creature anywhere in the universe that isn’t plainly visible to His sight. Nothing is shut out before the eyes of God. This is one of those attributes that should bring us comfort knowing of the Divine Presence in our lives. An all knowing, all caring presence. This is our comfort knowing that our struggles, our temptations, our problems and our very needs are all known to a loving God. “For I know the plans I have for you, declares the Lord, plans for welfare and not for evil, to give you a future and a hope.” (Jeremiah 29:11). A future and a hope – what more do we need? What more than knowing that a loving God has promised us this? What more do we need? It is important that we know our God. The God that we worship has revealed Himself to us through His Word. If we are to understand His meaning for our lives we need to understand it through the lens of His perfect Word. If we are to understand the power He has to shepherd us, to care for us, to transform us or to secure our salvation we need to know that He has already revealed it to us. If we are to understand His love for us, His desire for us to abide in Him, or His sacrifice that He has made on our behalf, we must know Him through His Word. We need to read His Word which is His revelation to us. To know Him is to understand His character and His attributes as He has revealed them to us in the Bible. His omniscience is one of those attributes that is important to understand. Does He personally know each one of us? There are going to be times when we feel alone or insignificant. There will be those times when we feel that hope seems so far off. Who do we call on for our comfort? Who can we rely on? After all, we are just one small person in a world of billions. One small insignificant person? Not to a loving God. When we despair are we not acting like an unbeliever? Are we not acting as one that does not have the hope we have knowing God’s love for us? We are admonished if we lose such hope. “Do not be like them, for your Father knows what you need before you ask him.” (Matthew 6:8). This is the power of an all knowing omniscient God. 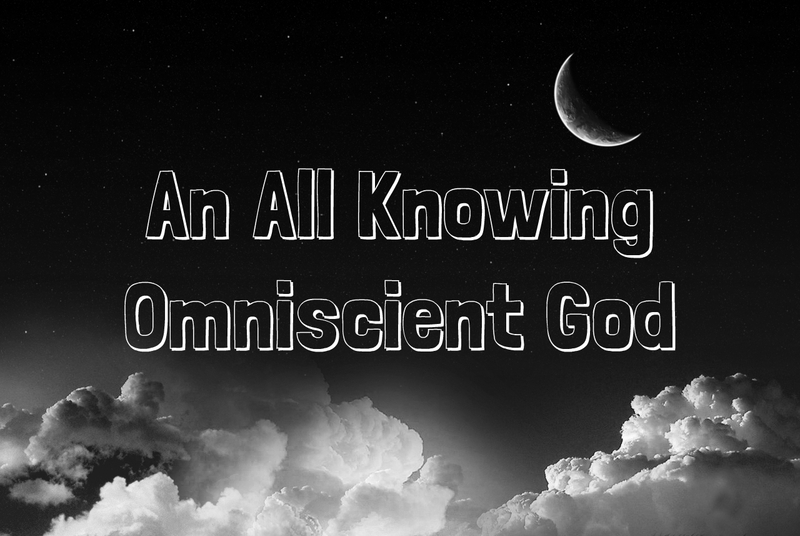 So just how all knowing, how omniscient, is our God? How can He possible know our individual needs, concerns and struggles? He has already explained all that. We need just to look in His Word. God is the Creator. The Creator of heaven and earth and all things seen and unseen is the God we worship. “The Lord is the everlasting God, the Creator of the ends of the earth. He does not faint or grow weary; his understanding is unsearchable.” (Isaiah 40:28). “He determines the number of the stars; he gives to all of them their names. Great is our Lord, and abundant in power; his understanding is beyond measure.” (Psalm 147:4-5). “Do you know how God lays his command upon them and causes the lightning of his cloud to shine? Do you know the balancings of the clouds, the wondrous works of him who is perfect in knowledge?” (Job 37:15-16). God is the key to knowledge and the wellspring of wisdom. The Lord our God is the standard of all knowledge and wisdom. “Oh, the depth of the riches and wisdom and knowledge of God! How unsearchable are his judgments and how inscrutable his ways! ‘For who has known the mind of the Lord, or who has been his counselor?’ ‘Or who has given a gift to him that he might be repaid?’ For from him and through him and to him are all things. To him be glory forever. Amen.” (Romans 11:33-36). God’s knowledge is incomprehensible to us. Ours is a finite mind, our knowledge limited and our wisdom often brought into question. God’s knowledge, therefore is beyond our comprehension. Knowing that He surpasses our knowledge and wisdom should give us the ultimate sense of confidence in Him. “Great is our Lord, and abundant in power; his understanding is beyond measure.” (Psalm 147:5). “For my thoughts are not your thoughts, neither are your ways my ways, declares the Lord. For as the heavens are higher than the earth, so are my ways higher than your ways and my thoughts than your thoughts.” (Isaiah 55:8-9). God is aware of all that happens. Do we wonder who is in control? If we believe in the God of the Bible we should have confidence. “The Lord looks down from heaven; he sees all the children of man; from where he sits enthroned he looks out on all the inhabitants of the earth, he who fashions the hearts of them all and observes all their deeds.” (Psalm 33:13-15). “For he looks to the ends of the earth and sees everything under the heavens.” (Job 28:24). “And no creature is hidden from his sight, but all are naked and exposed to the eyes of him to whom we must give account.” (Hebrews 4:13). God knows every human thought. Do we wonder whether He hears our prayers, knows our concerns or burdens? Does He really know me personally? “And you, Solomon my son, know the God of your father and serve him with a whole heart and with a willing mind, for the Lord searches all hearts and understands every plan and thought. If you seek him, he will be found by you, but if you forsake him, he will cast you off forever.” (1 Chronicles 28:90). “He who planted the ear, does he not hear? He who formed the eye, does he not see? He who disciplines the nations, does he not rebuke? He who teaches man knowledge – the Lord – knows the thoughts of man.” (Psalm 94:9-10). God knows our every need and works His will for our good. We should never doubt God’s love for us or question His ability to work His will for our good. “For I know the plans I have for you, declares the Lord, plans for welfare and not for evil, to give you a future and a hope.” (Jeremiah 29:11). “Therefore I tell you, do not be anxious about your life, what you will eat or what you will drink, nor about your body, what you will put on. Is not life more than food, and the body more than clothing? Look at the birds of the air: they neither sow nor reap nor gather into barns, and yet your heavenly Father feeds them. Are you not of more value than they? And which of you by being anxious can add a single hour to his span of life? And why are you anxious about clothing? Consider the lilies of the field, how they grow: they neither toil nor spin, yet I tell you, even Solomon in all his glory was not arrayed like one of these. But if God so clothes the grass of the field, which today is alive and tomorrow is thrown into the oven, will he not much more clothe you, O you of little faith? Therefore do not be anxious, saying, ‘What shall we eat?’ or ‘What shall we drink?’ or ‘What shall we wear?’ For the Gentiles seek after all these things, and your heavenly Father knows that you need them all. But seek first the kingdom of God and his righteousness, and all these things will be added to you.” (Matthew 6:25-33). What is the proper response to God’s omniscience? The inspired apostle Paul provided a fitting answer in Colossians 3:23-24: “And whatever you do, do it heartily, as to the Lord and not to men, knowing that from the Lord you will receive the reward of the inheritance; for you serve the Lord Christ.” Those who refuse to serve the Lord should be frightened by God’s omniscience, because God knows of every sin. For God’s own, however, the implications of God’s knowledge are sources of peace and strength. “Oh, the depth of the riches and wisdom and knowledge of God! How unsearchable are his judgments and how inscrutable his ways!” (Romans 11:33). “Beloved, if our heart does not condemn us, we have confidence before God; and whatever we ask we receive from him, because we keep his commandments and do what pleases him. And this is his commandment, that we believe in the name of his Son Jesus Christ and love one another, just as he has commanded us. Whoever keeps his commandments abides in God, and God in him. And by this we know that he abides in us, by the Spirit whom he has given us.” (1 John 3:21-24). Ultimately, the God who knows everything will judge humans based on how we use the knowledge that has been revealed to us. We must act based on our knowledge to prepare for eternity. We must understand that an all knowing God works for the good of His people. We must have confidence in His all eternal and unfaltering Wisdom and Knowledge and we must take confidence in Him that He know us intimately. ← The Lord has established his throne in the heavens, and his kingdom rules over all.